By Ross Elliott - posted Wednesday, 30 November 2016 Sign Up for free e-mail updates! There's a famous scene in Monty Python's Holy Grail where dead bodies from the plague are being heaped onto a cart. One body, about to dumped on the cart, protests that "I'm not dead yet."' "I'm getting better… I might go for a walk" he protests, until the collector of dead bodies clubs him on the head and gets on with his business. The way we dismiss the future of our manufacturing sector reminds me a lot of that scene. Manufacturing, we are told, is largely finished in this country as the art of making things is lost to low labour cost countries against which we simply cannot compete. Disciples of the 'new' economy would have you believe that all the jobs worth having are now in high value professional services, which are mostly located in our inner cities. Only last year, Prime Minister Malcolm Turnbull called for an "ideas boom" for Australia to replace the mining boom and provide growth, prosperity and jobs. A national "Knowledge Nation" summit was held to support the Federal Government's "National Innovation and Science Agenda" and a host of 'rock stars' of 'the innovation economy' were announced as part of "Knowledge Nation 100" – the "visionaries, intellects, founders and game changers" destined to drive our future prosperity. Our urbanisation agenda aligns with this future vision of work and industry, by planning for centralised economies and highly educated inner urban workforces of the professionally qualified, clustered around urban cores. The preferred urban form to make this happen, we are told, are cities like London or New York or San Francisco or Singapore – centres of global commerce, technology and finance. In all this, it seems there is now little room for industries like manufacturing. But despite the widespread predictions of manufacturing's demise, the sector is still surprisingly resilient. 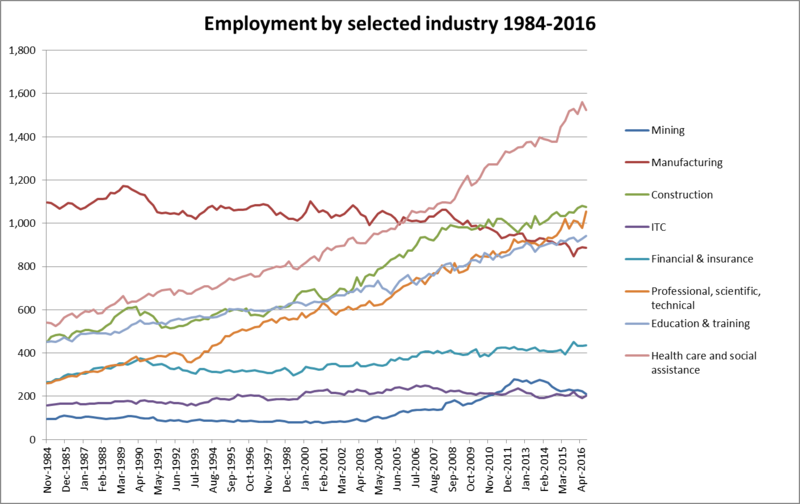 The graph below plots employment by selected industry for over 30 years. (Click graph to enlarge). The gradual demise of manufacturing is undeniable, although it has far from collapsed and still employs some 800,000 plus Australians. By contrast, the much celebrated rise of the information, media and communication (ITC) sector looks a bit lame by comparison. There are still four times as many people employed by manufacturing as the ITC sector. Big growth has occurred in white collar professionals in the professional, scientific and technical sector, as well as education. Nothing however can match the growth of the health care and professional assistance sector (which includes a very high proportion of part time jobs). 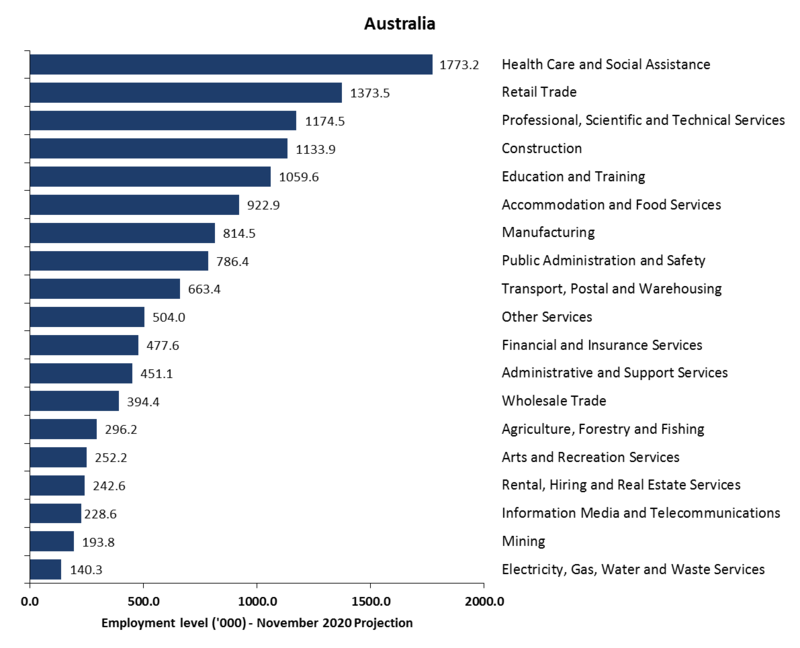 Even by 2020 (graph below), according to the Federal Department of Employment, manufacturing will still be our seventh largest employer, responsible for over 800,000 pay checks nationally. That's more than four times the number of people directly employed in mining, to put that into context. The much-hyped tourism industry, for further context, is predicted by Tourism Research Australia to employ 656,000 people by 2030 – which is 150,000 fewer and ten years later than manufacturing is predicted to employ by 2020. What's the point of this? Simply that the rush to embrace new industries centred around the services sector which offers high incomes linked to technological or particular professional skills can distract attention from less glamourous sectors which continue to chug away, with limited public policy support and even official disinterest. Manufacturing has been one of those. A 'smoke stack' industry now generationally removed from the lives of urban elites, it has been largely written off as uncompetitive and with little future. Yet it is one of our largest employers and one which offers longer term full time jobs, as opposed to shorter term part time roles (as you might find in for example tourism, or health care and social assistance). It could be that public policy attention (and the industry support that accompanies it) reflects the political favourites of the day. If that is the case, the manufacturing sector might need to revisit its public advocacy and somehow demonstrate to policy makers that Australia's economic engine cannot just rely on publicly funded 'bed pan' industries or high glamour tourism jobs where low wages and part time status are the norm. These industries may indeed absorb large numbers of people who would otherwise be unemployed and they have a tremendously valid role to play in our economy. But it's always a question of balance and what seems to have been a dismissal of manufacturing's potential or its future by a cross section of policy leaders and commentators while 'innovation' and almost anything to do with technology are heaped with praise is a telling sign that the economic debate needs some rebalancing. Note: The "information media and telecommunications industry" includes businesses involved in newspaper, magazine, book, and directory publishing; software publishing; motion picture and sound recording publishing and distribution; radio and television broadcasting; internet publishing and broadcasting; telecommunication services, internet service providers & web search portals; data processing, web hosting and electronic information storage services; and library and other information services.